West Indies: Can They Beat A Test Playing Nation!! West Indies came to the World Cup with least expectation. Their team, batttered by internal issues and not-so-united by larger-than-life projection of Gayle, Dwayn Bravo and Pollard, hardly provided the confidence to win. They did reach the quarter-final, although they are yet to win a major country here. Captain Sammy knew it would be tough to be considered as a successful team, specially after the revival of the team from ‘player’s coup. For months now they are testing the players to provide a consistent team. They arrived at World Cup with all big names, including Sarwan and Chanderpaul. The young faces of Roach, Sammy, Russel, Darren Bravo, Smith and others were expected to represent West Indies, the team which hass fan following around the globe, including India, considering their era of invincibility when they won the first two World Cup. At times, glorious history kills one. The burden of representing the greats can be painful, if success is not achieved. In the Group Stage West Indies team have not done anything special to be praiseworthy. Roach has showed how West Indies still produces lethal fast bowlers. He has taken a hattrick, surprisingly, the first by any West Indien bowler. His 6-wickte haul has been the best spell of the tournament so far. Pollard and Gayle have batted well in bits and pieces. Darren Bravo has shown consistent performance, although comparing to Lara would be foolish now. Sammy and Russel has given good allround performance. Benn has been one of the best spinners of the tournament. But, the only problem has been their overall performance against the top three teams of their Group B. They could not match South Africa, India and England. They did defeat minnows convincingly. Yet, a better show against at least one of the top three teams could have given them more confidence before they meet Pakistan in the knock-out match. The bowlers look lethal and mean. They have forced Bangladesh, who defeated England, to succumb to the lowest-ever team score in World Cup by a test playing nation, that too while playing in Bangladesh, the den of tigers. They almost won against England, and gave a scare to India even after resting key players of the likes of Gayle, Roach and Chanderpaul. Defeats can turn positive, if result is not considered and they can consider their strength in the 3 defeats. Overall they look one of the best bowling side alongwith Pakistan in the tournament. 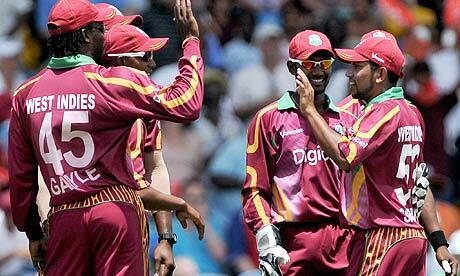 Their batsmen must buckle up and announce the return of mighty West Indies at the world arena. Can Pakistan Control Their Good Performance! !